Roman Inscribed Stone by karl & Ali (Geograph). OS Grid Reference: SD 61411 73931. In the 15th century parish church of St John the Baptist at Tunstall, near Kirkby Lonsdale, Lancashire, there is a fragment of an inscribed Roman stone, which was perhaps part of an altar but, according to the church guide, is actually a votive stone with a dedication in Latin to two Roman dieties – very roughly carved onto it; the stone was found in the 1800s at the Roman fort of Burrow (CALACVM), a couple of miles to the north. The stone was brought into the church from the churchyard in the early 20th century and was set (upside down) into a window jamb of the north aisle during restoration work. Also of interest within the church is the altar stone which is considered to be Anglian and to date from the 8th century? St John the Baptist’s church can be found along Church Lane about ¼ of a mile to the northeast of the village. The village of Tunstall itself is roughly 3½ miles to the south of Kirby Lonsdale on the A683 and 4 miles southwest of Cowan Bridge. 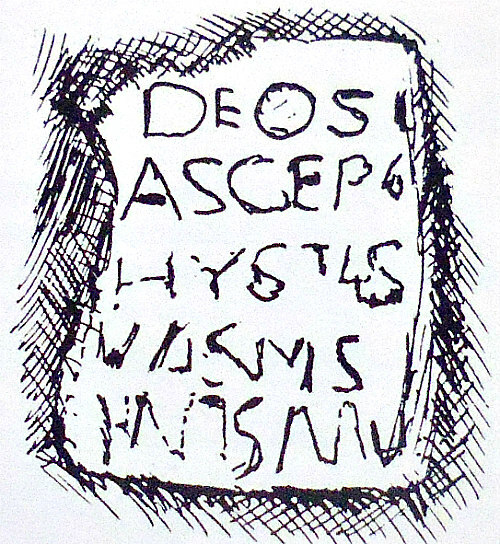 The Roman votive ‘altar’ stone with its Latin inscription reads: ‘DEOS ASCLEPIO ET HYGIAEAE P S SVA CVM SVIS IVL SATVRNINVS’ and when translated is something like: “To the dieties (gods) Asclepius and Hygiaea, Julius Saturninus placed This Here for himself and his family.” The word ‘SANCTO – Sacred’ can sometimes be placed at the beginning of an inscription like this as another variation. Drawing of Roman Stone, John Cotton. Sara Mason (1994) adds that: “The stone of which the altar in the present church is made is considered to be Anglian (eighth century) and bears evidence of early Christian worship at Tunstall, possibly from when St Wilfred came westwards from Ripon. It was put into its present place in the 1950s. A medieval burial slab was reused and preserved, as a quoin in the old school house in the Church Lane. Also of interest: there are several Medieval carved stones leaning against the outside wall of the church, one of which could be a cross-head, but its age is uncertain though it is possibly Anglo-Saxon? Jones, Lawrence E. & Tricker, Roy, County Guide To English Churches, Countryside Books, Newbury, Berkshire, 1992. Mason, Sara, The Church And Parish Of Tunstall, (Drawings by John Cotton), December 1994. Pevsner, Nikolaus, The Buildings of England — North Lancashire, Penguin Books Ltd., Harmondsworth, Middlesex, England, 1979. 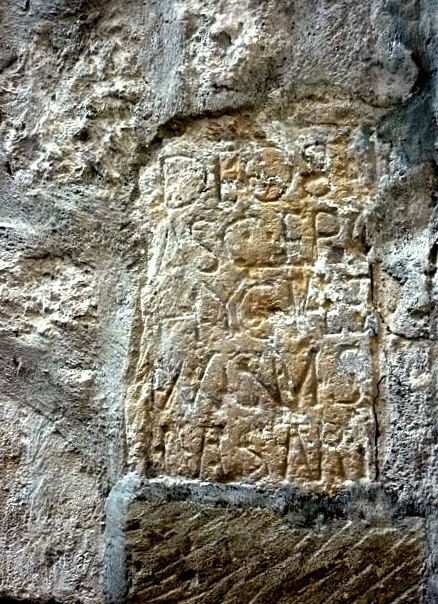 Categories: Inscribed Stones | Tags: Roman Inscribed Stone in St John the Baptist's Church at Tunstall in Lancashire | Permalink.